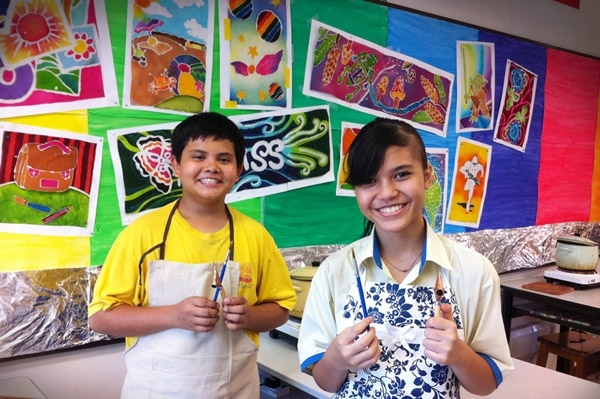 Batik painting is one of Metta School’s signature visual arts programme. In this programme, students are not only taught in the process of making batik painting art, but most importantly they learn other useful skills like responsibility for own work area, safety while handling equipment, simple first aid and fine motor skills. Batik painting is also known to be a therapeutic programme as students learn to ‘slow down’ and relax while engaging in the process of creating their own batik painting projects. Batik Painting is an old art of decorating cloth using wax as a dye repellent to cover parts of a design and dyeing the uncovered fabric with colour or colours. The word batik originates from the Javanese word ‘tik’, which means to dot. Batik is historically the most expressive and subtle of the resist methods.The batik process begins when the pattern is covered with hot wax as a ‘resist’. The fabric is then dyed producing a vivid and colourful patterns. The waxed patterns will not take the dye. The process is repeated to obtain multicoloured designs on the cloth. The wax is then removed through a process of ‘fixing’ and washing of the cloth in hot water. The cloth is then ready to be made into other by products or displayed as an art piece.